innovative cookware and kitchenware for your venue. Trenton International is a family owned company with our main operation based in Sydney, shipping to all parts of Australia and internationally. Our team is committed to bringing you the best in cutlery, crockery, glassware, kitchenware, bar, counter and related table service items. 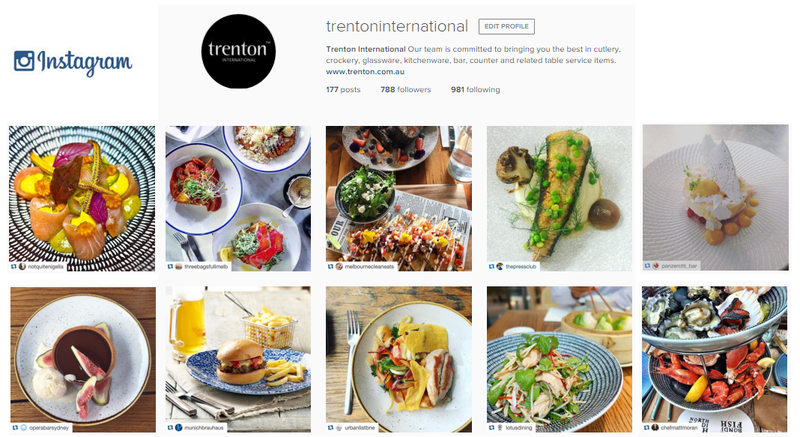 All our new brands and products highlight our ongoing efforts to bring you the best products for the hotel, restaurant, cafe, aged care and catering industries. The growing team at Trenton looks forward to working with you into the future to meet your specialised needs. Trenton is proud to release Karbon, a new range from RAK Porcelain. Available in 3 colours, Karbon Black, Karbon Limestone and Karbon Shale. The new Vintage Baguette and Vintage Rada cutlery ranges have a vintage satin finished handles, tines, bowls and blades that have a simplistic yet refined design. This collection of serving and dinnerware is versatile and durable for all sectors of the hospitality industry. New additions to the popular Luzerne collection are Drizzle, Linen and TinTin. The new mixology collection features luxury barware items and Luigi Bormioli’s new Lock-Eat pieces are great from food and beverage presentation. Welcoming Sidera, Diony, Next, Timeless, Tin Can, Craft Beer and Patisserie to the ever growing Pasabahce offering. Vidivi Italian glassware is universally recognised for its outstanding degree of transparency and strength. The Polysafe range is virtually unbreakable, durable and reliable. Made from the highest quality food grade polycarbonate, our drinkware looks and feels like the real glass equivalent.